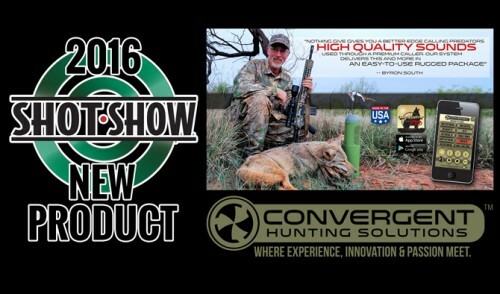 As most of you know, Savage has released the much anticipated A17, semiautomatic 17HMR rifle. This rifle has reached gun shops around the country, so the online reviews are starting to trickle out. 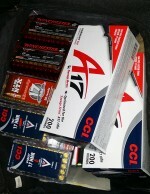 So far, it seems as if there have been mixed results, even with the new CCI A17 ammunition. Most of what I have read has been failure to feed issues and the magazine dropping out while being shot, with some reports of poor accuracy. I received my rifle directly from Savage, and once it arrived home with me, I immediately did what I do to every new rifle I acquire, I tore it down and thoroughly cleaned it. After the tear-down, I applied grease to the areas where Savage requests you do, then put it back together carefully, making sure everything was snug and at the torque they recommend. I ran some function tests with the magazine in the rifle, popping it in and out to get used to the “click” that tells you it is completely engaged. I then mounted a Bushnell AR Optics 4.5-18x40mm scope that I had just taken off another rimfire. After mounting the scope, I again removed the bolt to see how difficult it is with a scope mounted on the rifle. I did not have any issues, but if I did, the Savage “Basic Disassembly and Cleaning” video was available for reference. Ammo Packed & Ready To Go! While waiting for this rifle to arrive, I began collecting as many versions of the currently available .17HMR ammunition as I could get my hands on. 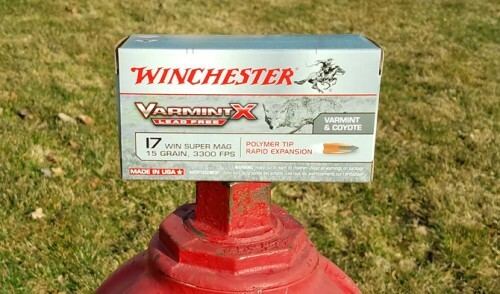 I had already picked-up and tested the new CCI A17 ammunition, so I filled up my ammo safe with other CCI ammunition, as well as Hornady and Winchester, including the lead free 15.5 grain NTX versions, also from Hornady and Winchester. The night before I headed up north, I packed all the ammo I had collected, with the intention to shoot some initial groups with each of the different brands and types of 17HMR ammo. 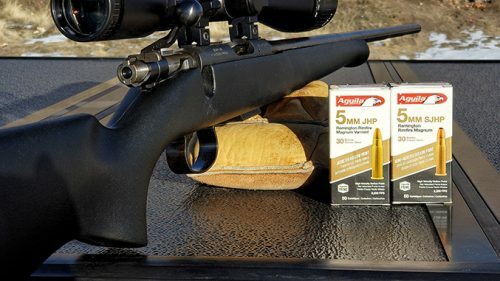 After spending some time at the bench, I saw that this rifle shot the CCI A17 ammunition best, with most groups hovering right around 1″ to 1.20″ at one hundred yards, and some of the other ammo choices in the 1.25″ to 1.50″ range. This was with a warm barrel and in-between cleanings during the break-in process. I was very impressed by the ease of pulling the rifle apart for cleaning out in the field. Even with the scope mounted, I was able to quickly and easily remove the parts needed to give me complete access to the barrel through the rear, so cleaning was a breeze. I also wiped-down the bolt and re-greased it with some M-Pro 7 Synthetic Gun Grease , per the instructions in the Savage video linked above. One item of note is the expelled empty brass. 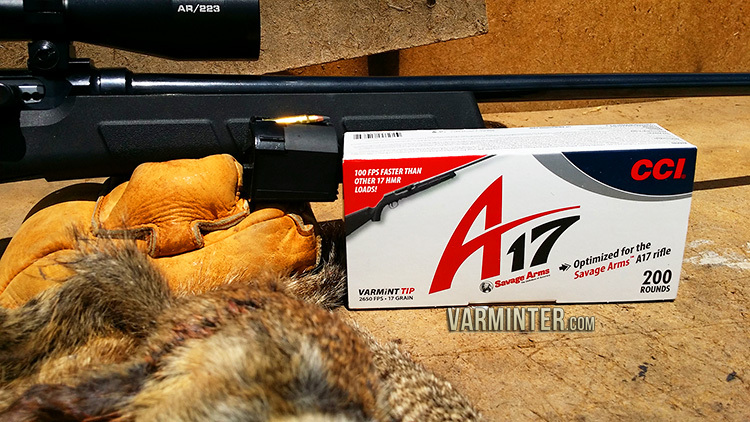 Be aware that the brass in your Savage A17 will be ejected up to 25′ away. 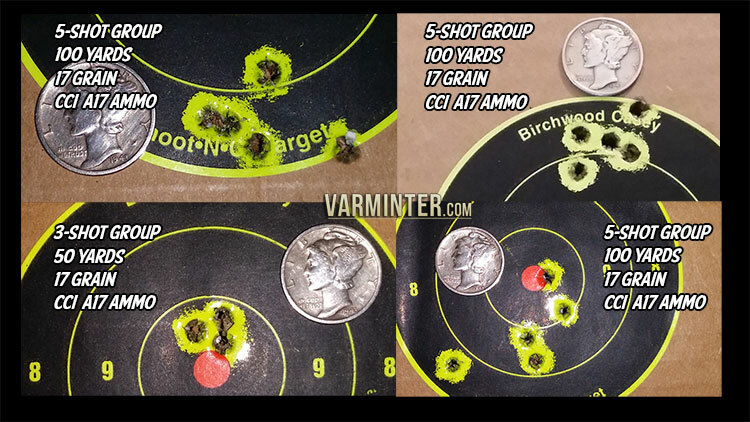 We were running a contest to see how far the brass would end up, and a CCI A17 empty won at very close to 30′ away! Btw, it also means that unsuspecting cameramen standing a distance away may still get burned by the ejected brass! Let’s just say that Tom showed me the burn marks! I settled in on the A17 ammo for now, because the Savage A17 liked it, and it performed well while I was up north shooting the smaller Belding’s Ground Squirrels out of my CZ 452. But, in a (near) future range report, I will complete a full test of all the ammunition in ideal shooting conditions, as well as another test that should interest those who are concerned about reliability. 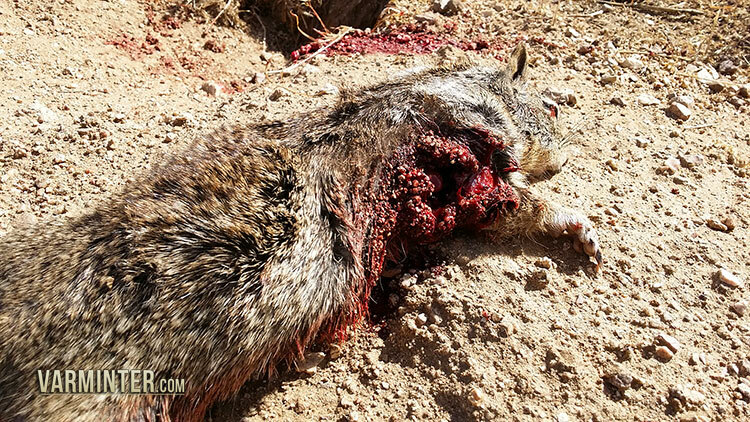 Although I shot many groups, my plan was to use this time to hunt on a property that was in dire need of some ground squirrel control. 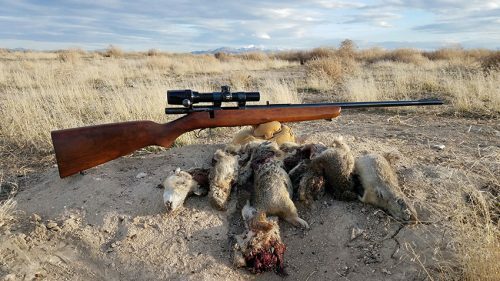 Besides, what better test of a rifle’s accuracy and functionality, then shooting ground squirrels in the sun, dirt and grit of the Central Valley of California? Before I move forward onto the hunt report, I wanted to address the issues I ran into while at the bench. As I began to shoot the rifle, I experienced what a few others have reported, with the magazine falling out while shooting. I quickly realized that I was not snapping the magazine into place every time. I found that popping in the magazine while the bolt was pulled, or locked back, resolved the issue. I did have a few failures to feed, but only on some of the older ammunition I was shooting, namely the first year Hornady ammo and the lead free ammo (which is about 3-4 years old). The newer ammo did not have any issues and functioned well, even while shooting some 10-round “mag-dumps”. The trigger is on the heavy side. I did not make any adjustments to it, but will do so before I shoot more at the bench. Once I was done at my range, I packed up all my gear and headed up to the Central Valley of Southern California. There was a farm that needed me. So, armed with the Savage A17, lots of ammo, my video camera and my cameraman, we arrived ready to clean-up. 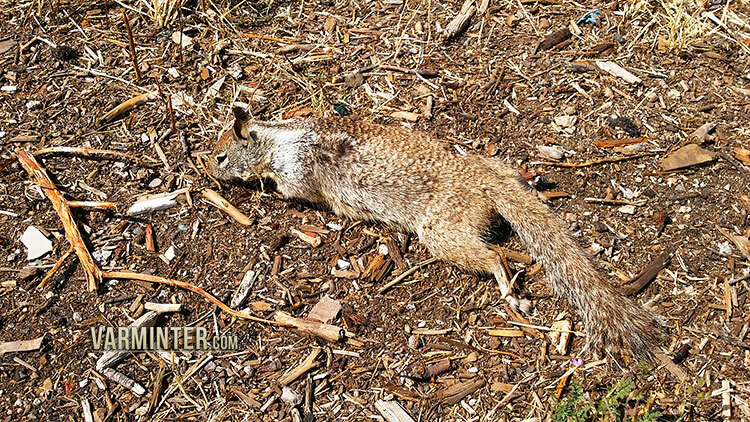 Even with the heat of the late morning, there were still many ground squirrels out and about. 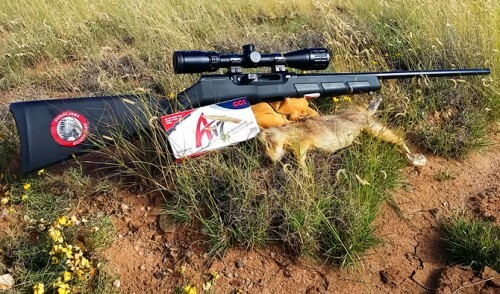 A few of my shots ended up being in the 50 to 75 yard range, but towards the end of the hunt a few hours later, I was making chip shots on ground squirrels at 100+ yards, with no issues, even with the wind. 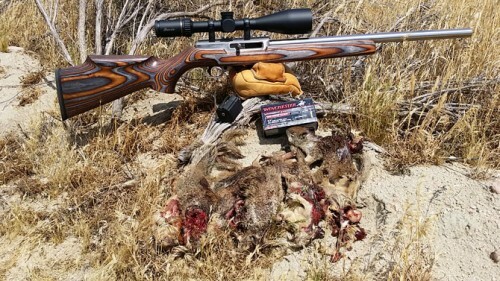 With the amount of ground squirrels out, it was nice to have a semiauto to make a follow-up shot on any that decided to stick around after their buddies were shot. 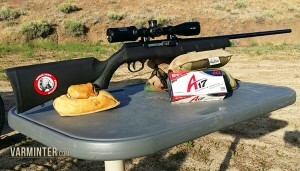 However, the semiauto function of the Savage A17 came in handy on a couple of shots where I simply missed the shot. I’m chalking up my misses to the wind, just because I was not having any issues until the wind picked up quite a bit. 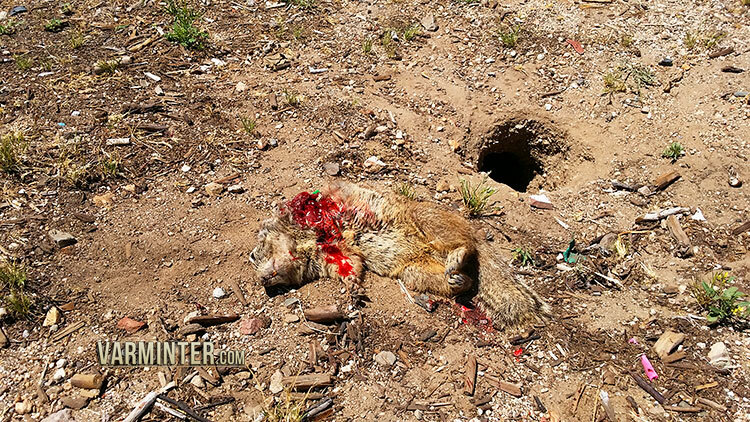 On one of these shots (shown in the video above), I shot just low on a ground squirrel that was laying out behind his mound. My second shot was rushed, and I shot right in front of him, where I assumed he would be standing when I pulled the trigger. 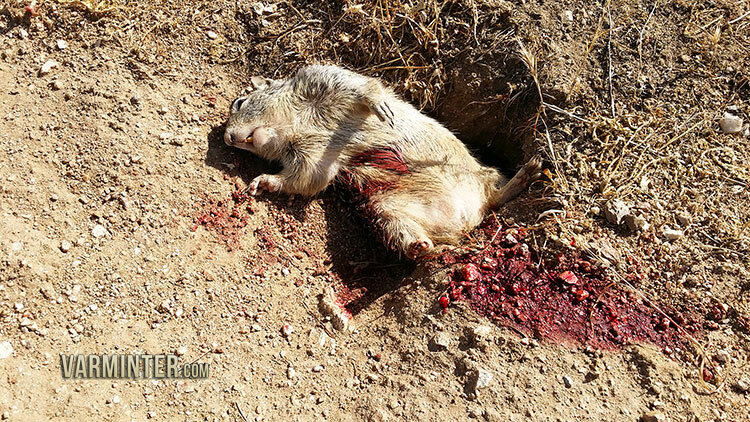 Finally, as the ground squirrel headed to another mound, I was dialed in on the wind and dropped him with the third shot from the 10-round magazine. The second, was when a small ground squirrel was up in a bush in an area where the wind was swirling. 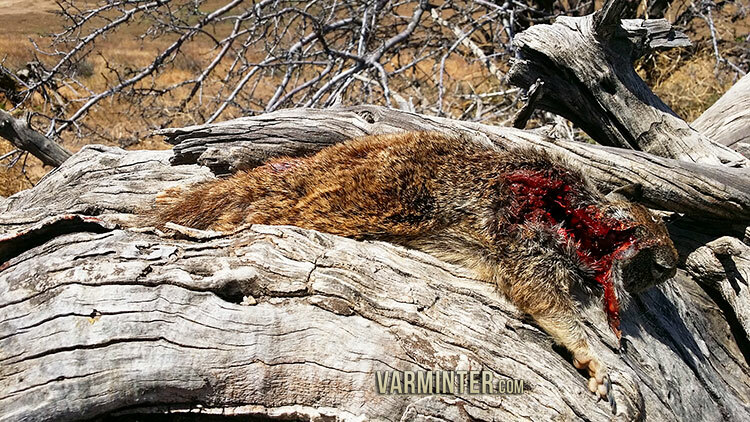 I was not in a comfortable position while shooting, so once again, I shot just under him, flinging him off the bush. As he made his way down the hill, I shot just under him again. The few seconds of him disappearing below the bushes allowed me to adjust my position and connect on my last shot. Exit Wound from the Long-Shot of the Day! 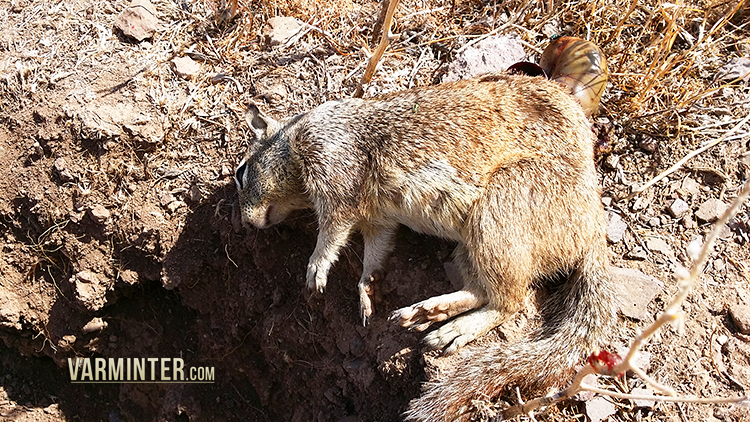 The longest shot of the day was a ground squirrel that I spotted up on the side of a hill, on a large dead-fall. Although the camera was in a good position for filming, there was no spot to make the shot from the same spot as the camera (I normally like to be as close to the camera as possible, in order to show you the shooter’s viewpoint). I moved to another area directly across from the ground squirrel, so I was shooting more perpendicular to the camera. 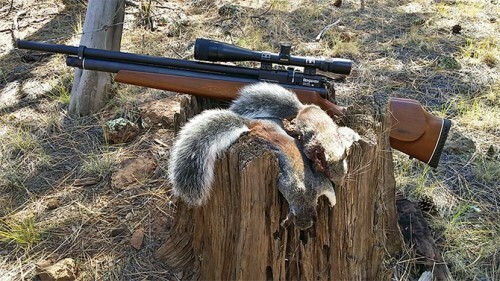 This was one of the last shots of the day and I was feeling very comfortable with the Savage A17 rifle, so I took a rest and found the squirrel in the scope. Just as I settled in for the shot, the squirrel adjusted his position from standing straight up on two legs, to standing a bit broadside on four legs. I squeezed the trigger and watched the hit of the bullet through the scope almost instantly. There was another ground squirrel on the same log, so when I saw the hit, I moved to make another shot on the second squirrel. I spotted it in time to see the smaller squirrel dive for safety into the brush below. It was very nice to not have to think about the second shot, knowing I was ready to go if another shot presented itself. 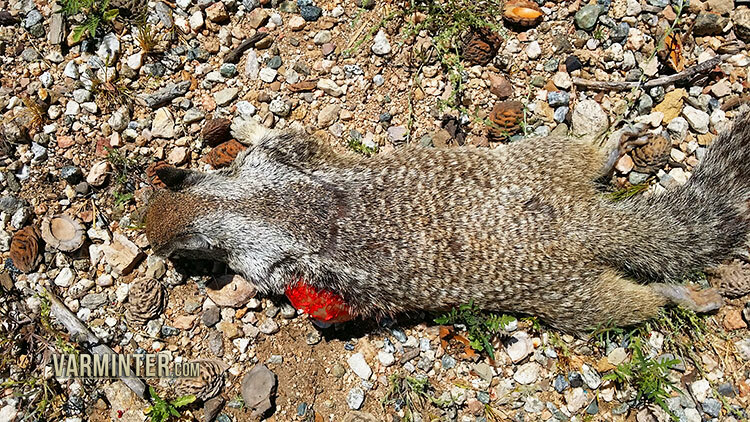 The day of hunting was otherwise, uneventful, with the Savage A17 functioning well and killing a bunch of ground squirrels. I found the gun comfortable to shoot, with the plastic stock being a bit stiffer than the previous new Savage release, the B.MAG. The rubber buttpad made for a comfortable hold against my shoulder and kept the rifle from sliding down while waiting for the shot. The first few times I shot the A17 at the bench, I was pleasantly surprised about how little the bolt moved while cycling the next round. I think because I shoot a lot of AR15 rifles, I am used to a heavier jolt as the action moves. The “recoil” (if you can call it that) on this little 17HMR does not even compare. Below is a gallery of the day’s kills. 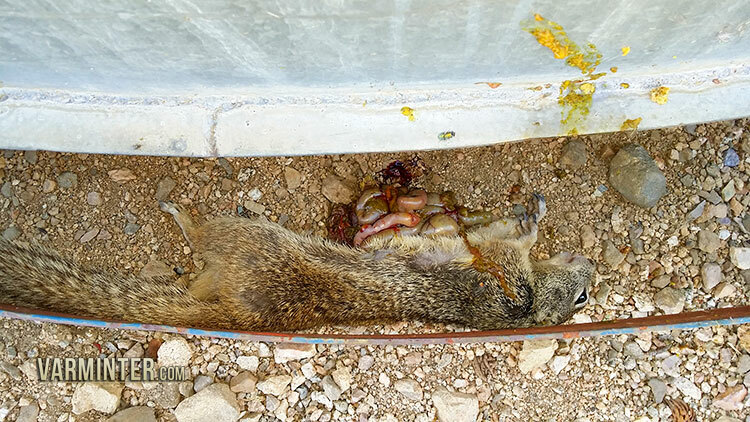 Before anyone asks, please remember that these are ground squirrels, which are considered “non-game” animals and are not recommended for eating, due to the diseases they, and the fleas they host, carry. 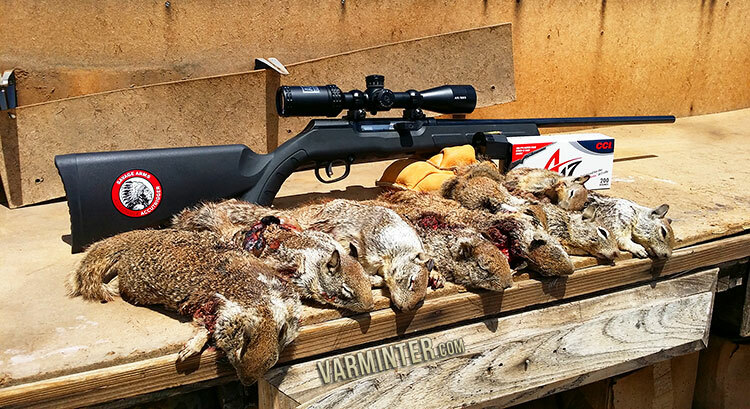 My full range report should be up in about one week, so keep checking back, or sign-up for Varminter Magazine updates on the front page.